← She Said–Fall Is. . .
Fall is pumpkin spiced donuts, beef stew, fruit-stuffed pork loin, smokey corn chowder, and pumpkin pies. However, there are a few salads that can cross-seasons and still fit in. 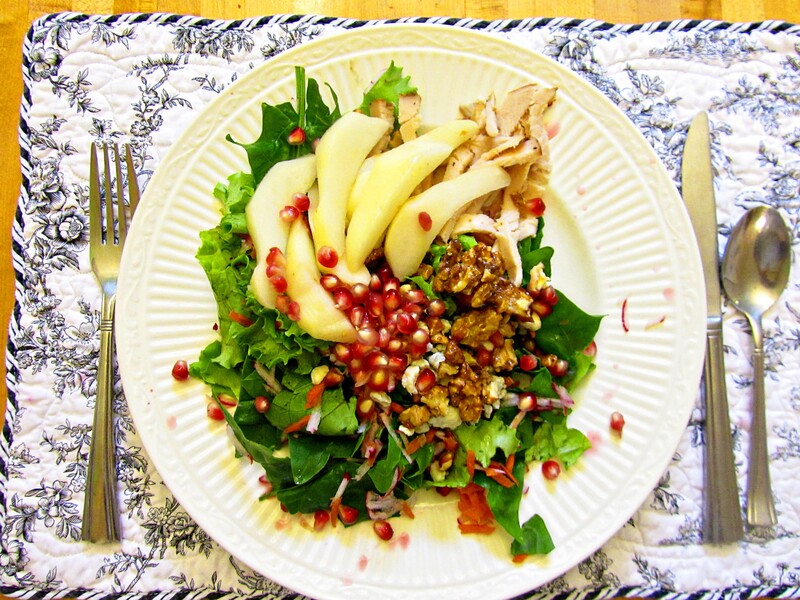 Today I made my take on the Pear, Walnut, Blue Cheese Salad–the classic Fall Salad. When I researched “Pear, Walnut, Blue Cheese Salads”, I found that “the key to French Fall Salads,” was the need for a Bitter, a Spicy, a Salty, and a Sweet. 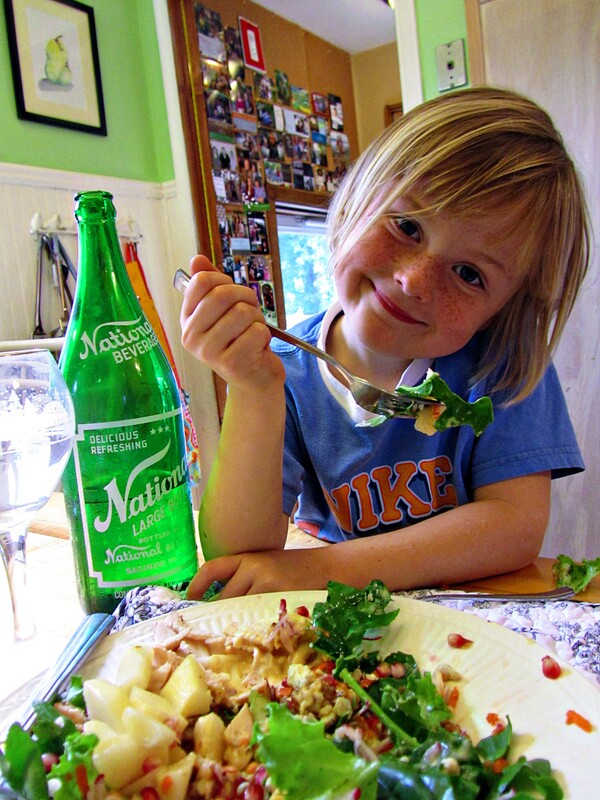 In his take on the Classic Fall Salad, the bitter = arugula, the spicy = the vinegar, the salty = Roquette Cheese, and the sweet = the pear. It is a good thing that the author clarified what she meant because I thought that she was describing our family. We have the Biter–he is one and teething, we have the Sweet Scout and the Spicy Eloise, and then there is the Salty–he adds flavour to everything. Now I enjoy the classic Pear, Walnut, Cheese Fall Salad, but I wanted to make it “mine”, so I created my own dressing–Not a vinaigrette. Let’s start with the dressing since it involves reducing some apple cider. 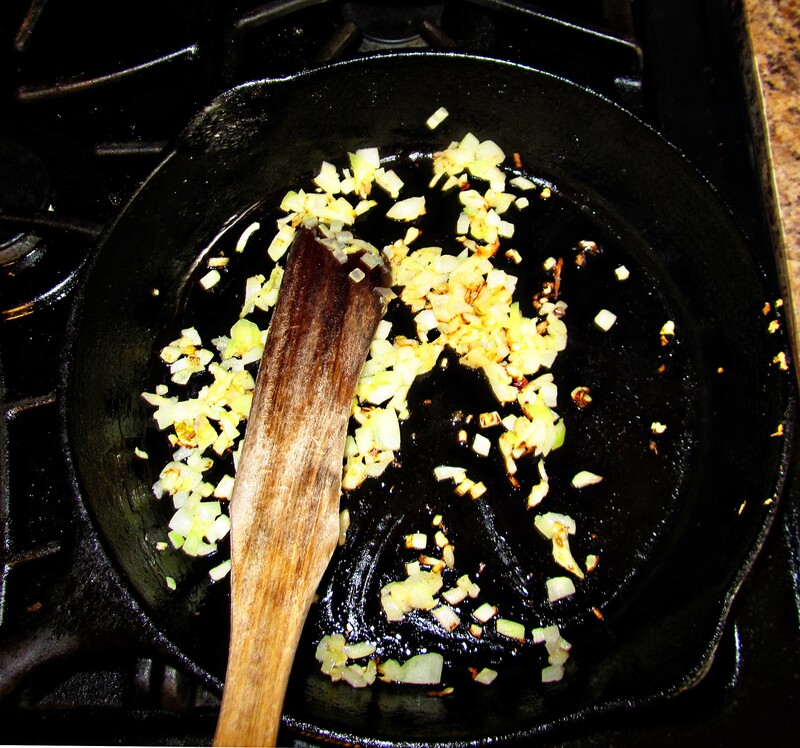 Saute an onion and a clove of garlic in a tablespoon or two of olive oil. 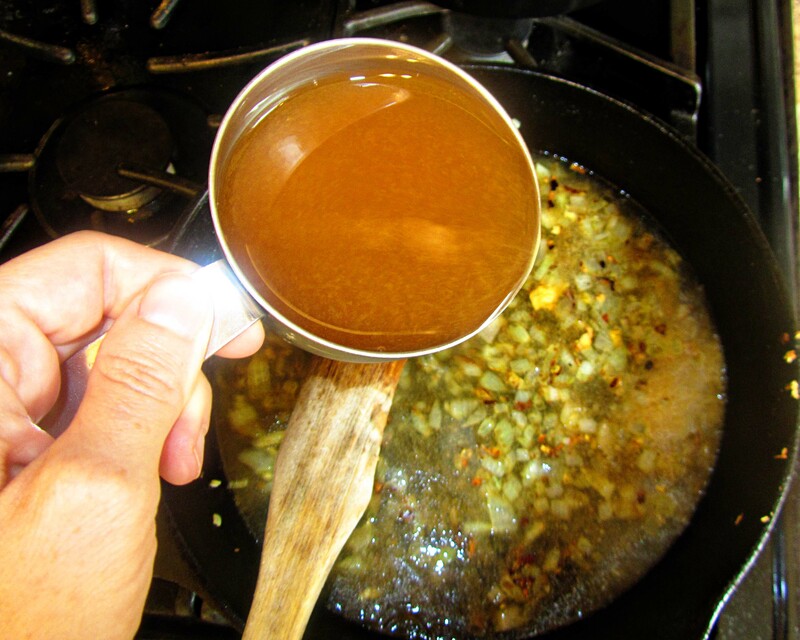 When the onions are soft, add 2 cups of apple cider and 2 T. of apple cider vinegar. 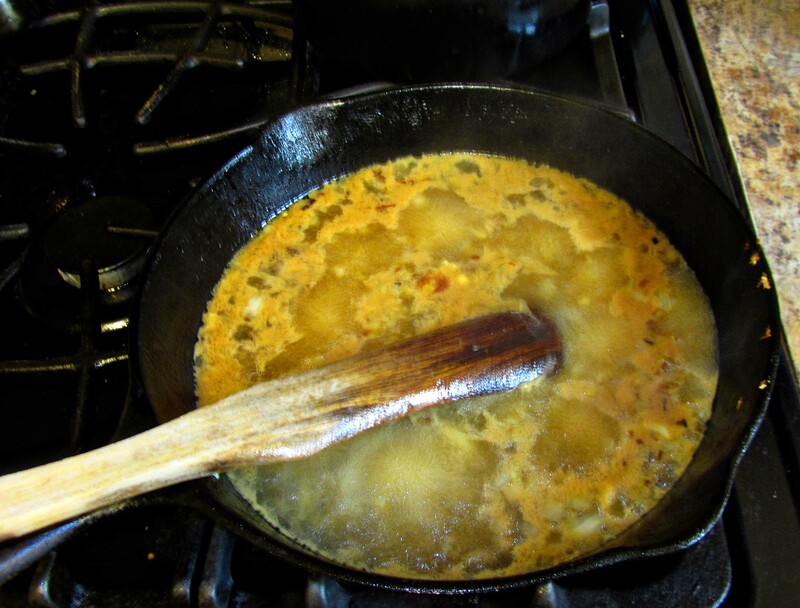 Cook and reduce until it is just on the edge of becoming a syrup. While this is reducing, let’s wash up some greens. 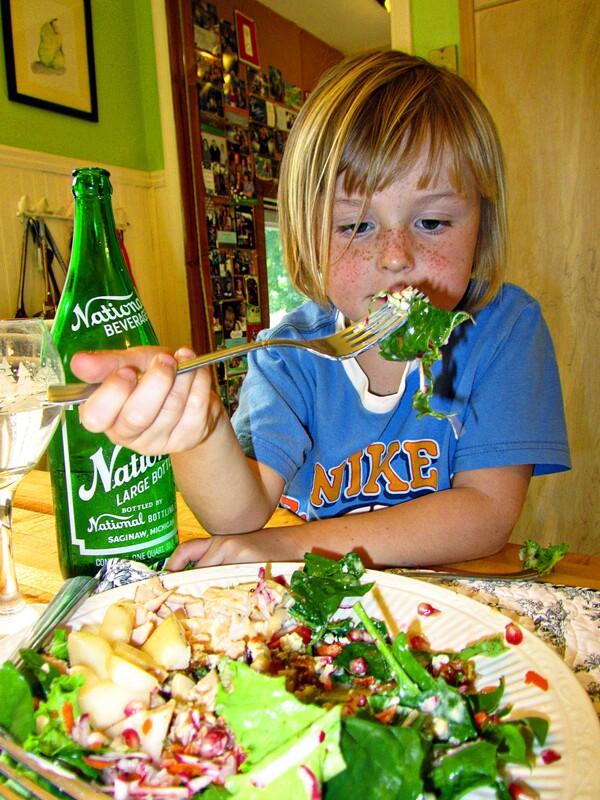 I live here at My Whit’s End with four picky eaters, so I don’t keep arugula or Roquette Cheese or Walnut Oil in my cupboard. 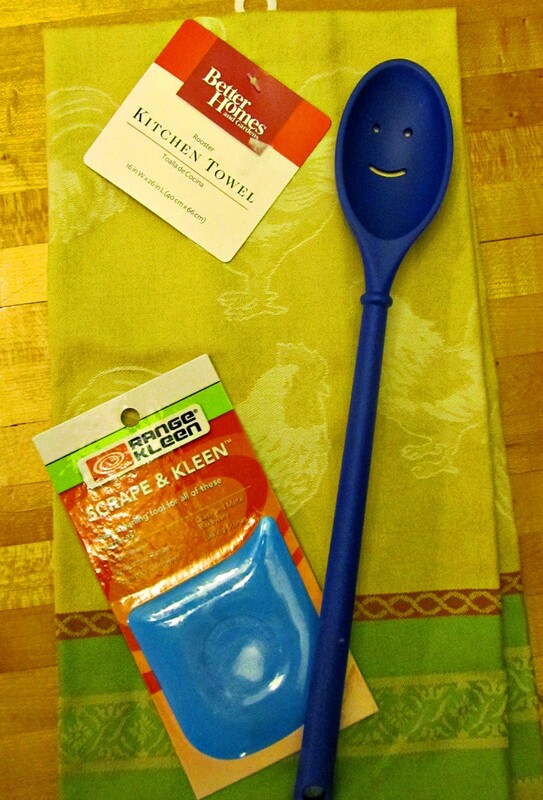 Now I would like too, but being a one income, one car, one bathroom family, it just doesn’t make the “need” list when I go shopping, so I have to cook with the ingredients I have been dealt. 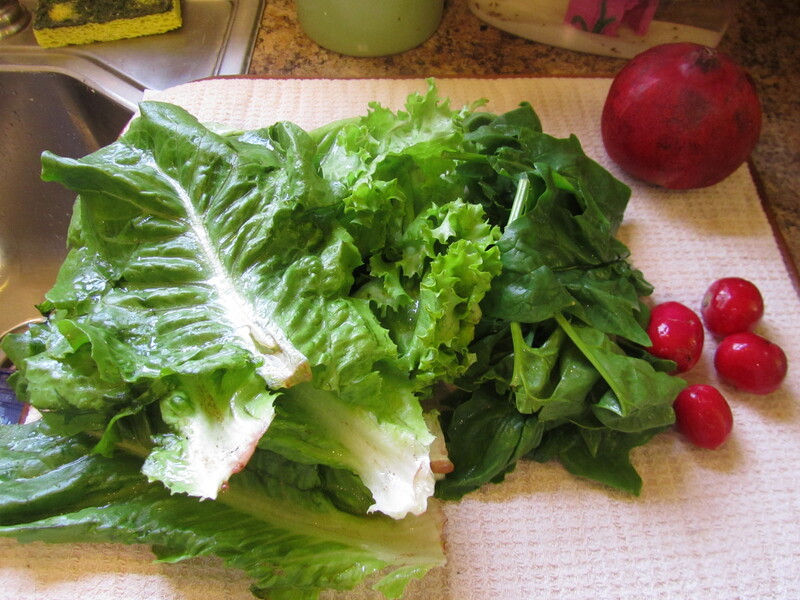 For the greens, I used a combination of curly leaf lettuce, Romaine, and spinach leaves–lettuces the kids will eat. Now when I add iceberg to a salad, the kiddos actually will clap, so when I need affirmation, I buy iceberg lettuce. 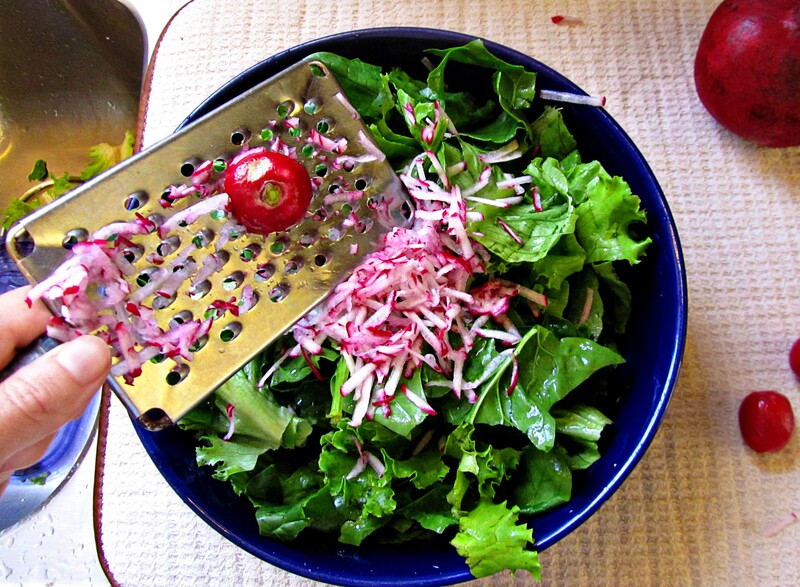 My greens were lacking that “bitterness” required by some French chef, so I added some grated radishes–not so strong for the kiddos and plenty of color. Radishes also fall in the “Shopping on a Budget with Picky Eaters” category. Radishes last forever in the refrigerator, so I can add color and bite to salads without buying radicchio. Since this is a Fall Salad, and fall means falling leaves, I added some carrots for color and to squeeze just a few more vitamins into the kiddos. If this salad is lunch, add some sliced turkey breast, grilled chicken, or pork tenderloin. 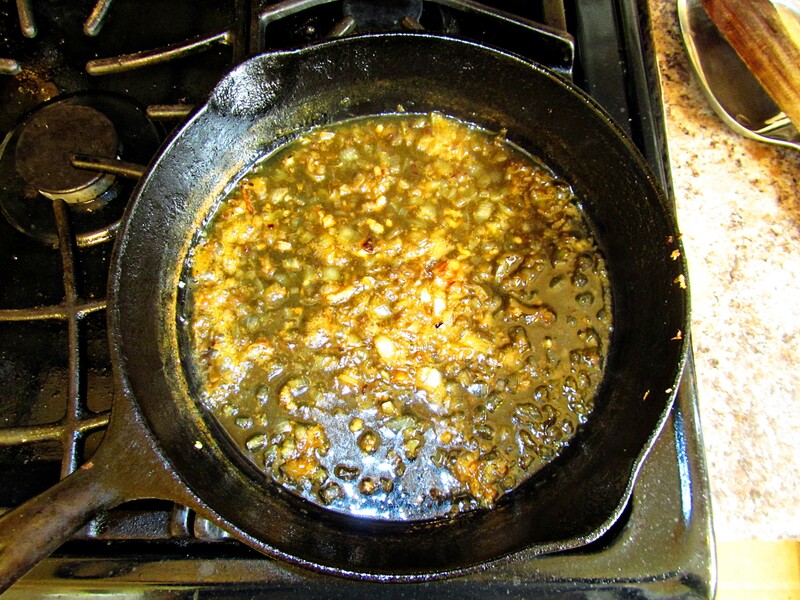 While the Apple Cider Dressing is reducing on low, get another pan and add about a cup of walnuts. 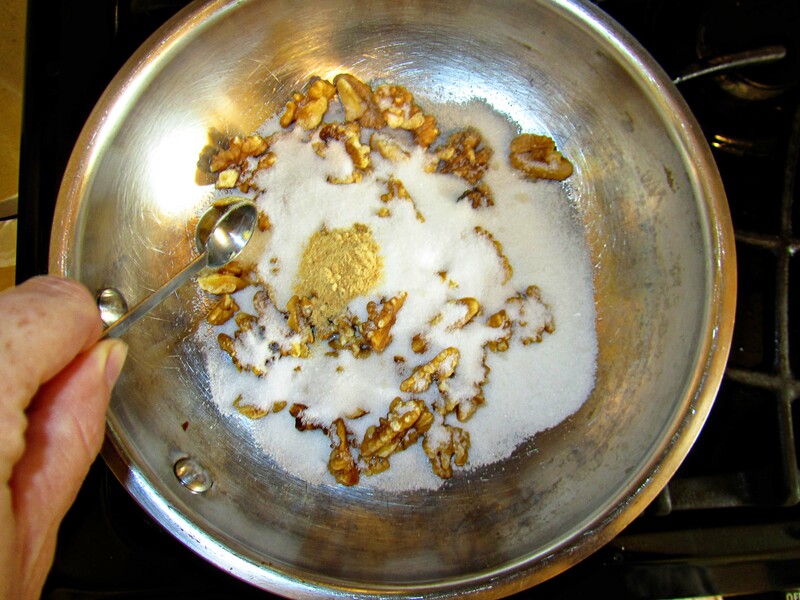 If you are a Conscientious Sugar Objector, you can just toast the walnuts to bring out their nuttiness. If you are a Confectioner Craver, add about a half of a cup of that wonderfully-refined-tastes-divine white sugar. I added a half of a teaspoon of ginger to give my the walnuts a “spiced fall flavour.” I couldn’t taste the ginger, so my next guess would be to add some Pumpkin Pie Spice in a larger quantity. However, at the time of press release, this idea had not been tried. If you try it, let me know how it worked for you. 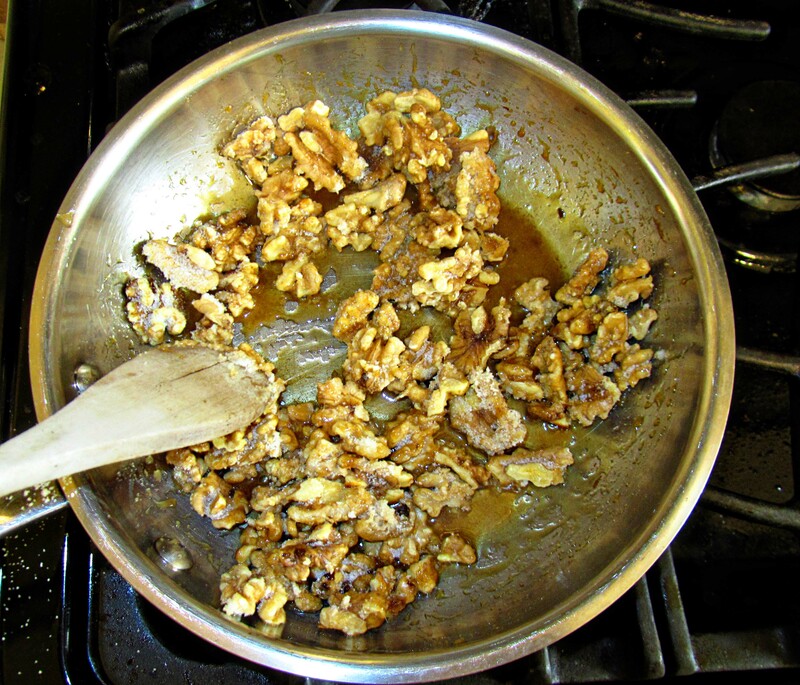 When the sugar has melted and carmelized, dump out the nuts on a cutting board to cool, then chop. The Apple Cider Dressing is probably reduced enough. Here are before and after photos to help you see how much to reduce the cider mixture. 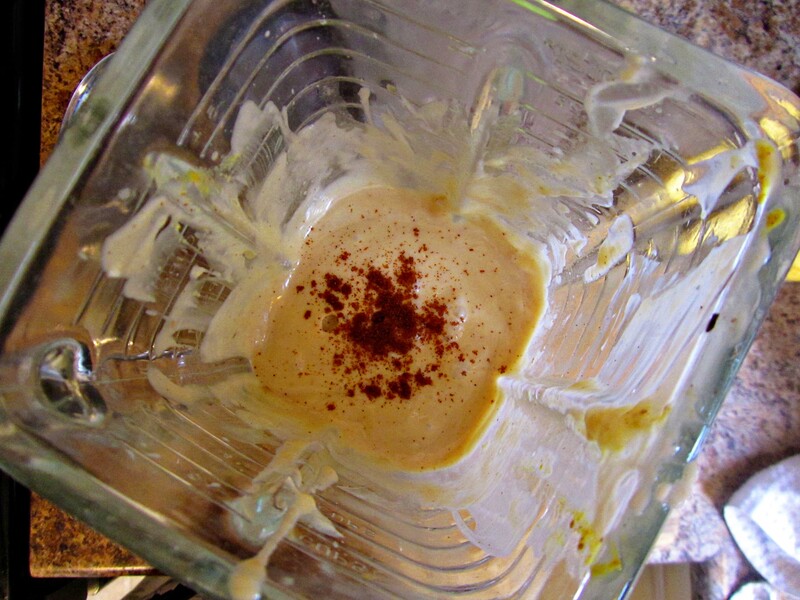 When I was scouting around for a salad dressing ideas, I came across a recipe that called for creme fraiche. Creme fraiche is divine. Creme franchise is like a cloud of British-ness on a scone with strawberries on top. Creme fraiche is la creme de la creme! An easy Creme Franchise recipe is to whip up some heavy cream add sour cream and let it set at room temperature for eight hours, then chill. Now an easy creme fraiche [pronounce krem fresh] recipe requires eight hours of forethought. Here at My Whit’s End the tide could change like in the Bay of Fundy before eight hours is up, so. 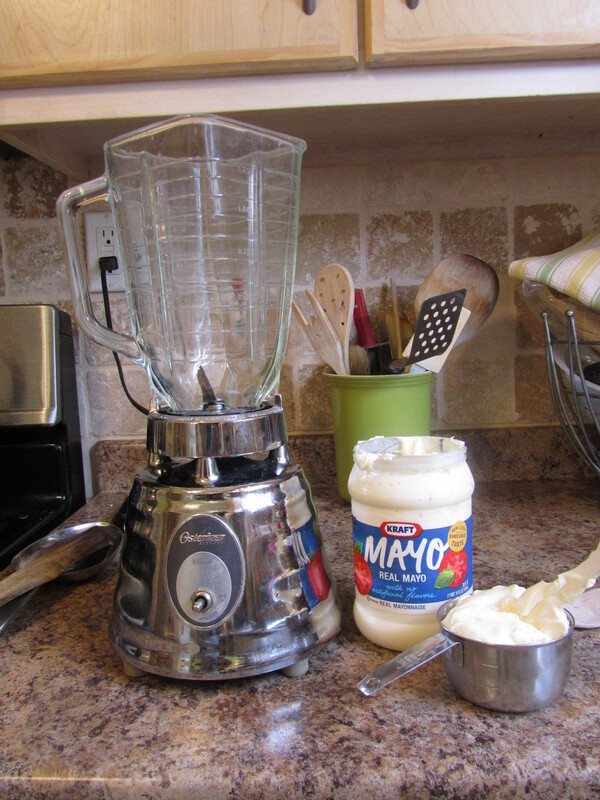 . .
grab some mayo and let’s make salad dressing. Add about 1 T. of Dijon mustard and about 2 T. of honey. If you have OCD, you can measure. 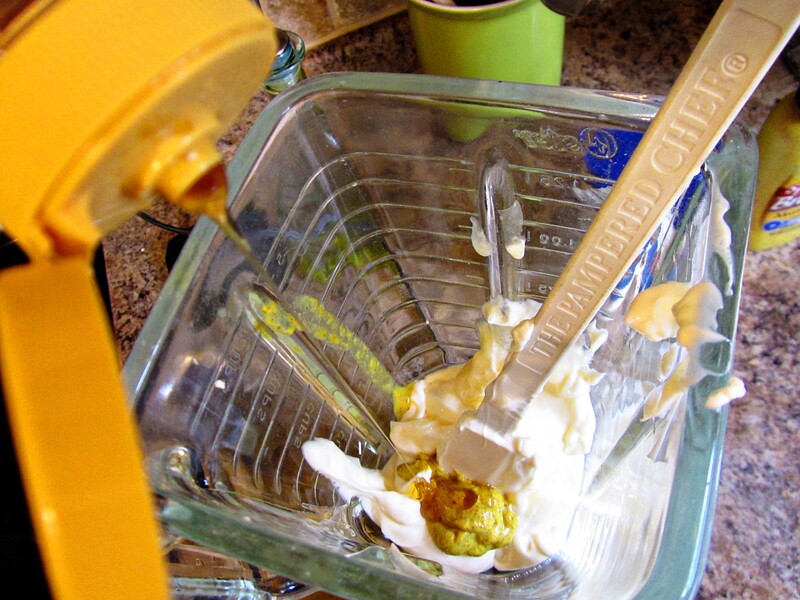 If the phone is ringing, a kiddo is asking you the square root of 49, and a baby is precariously teetering on a stool, then just squeeze a little of each into the blender with a cup-ish (two big spatula swloops) of mayo. 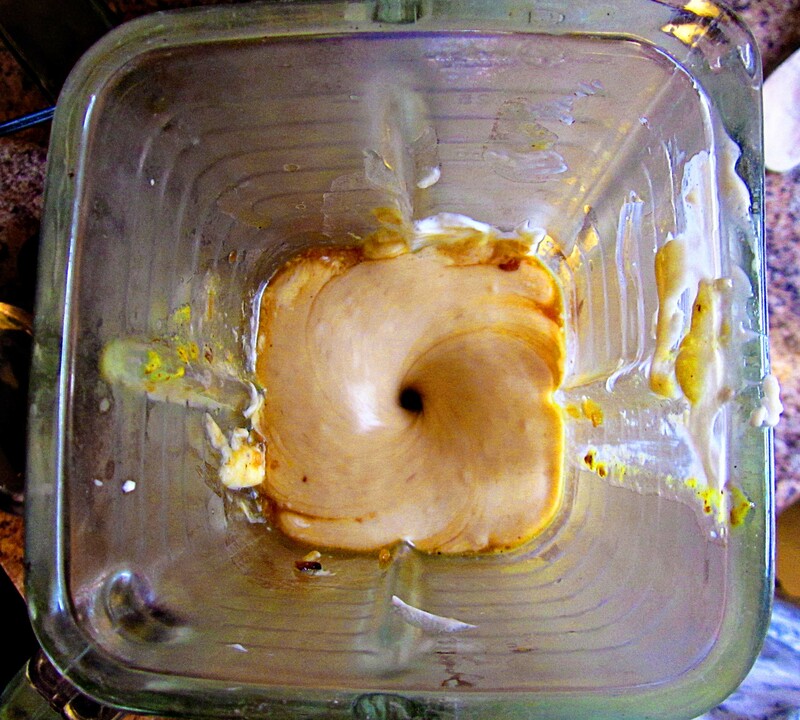 Add the reduced apple cider mixture, and whirl the flavours together. The next step separates the girls from the women; the Yankees from the Rebels; the meek from the mouthy; the sweet from the sassy. Will you or won’t you add some heat? Cayenne or McIlhenny’s (Tabasco for folk not from New Orleans) gives this sweet cider dressing a kick. To kick or not to kick is the question. Time to plate–add some blue cheese (or whatever you have handy) and some sliced pears. Time to enjoy–sit down and relish every bite. Time to share–relish almost every bite. Hey! that’s my lunch! That was fun (and delicious), but who is up for a challenge? 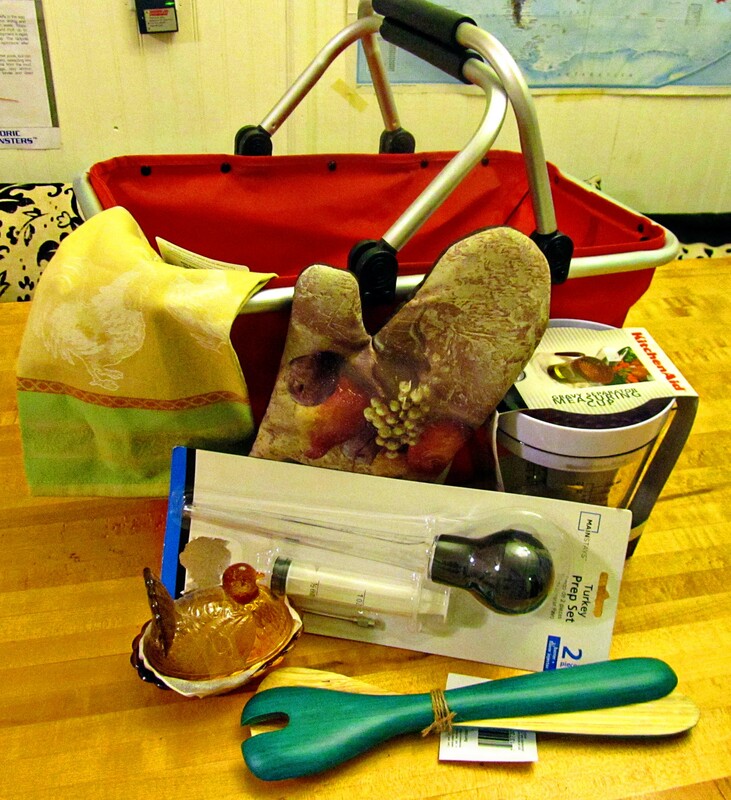 Let’s play our own blog version of Iron Chef combined with Chopped. 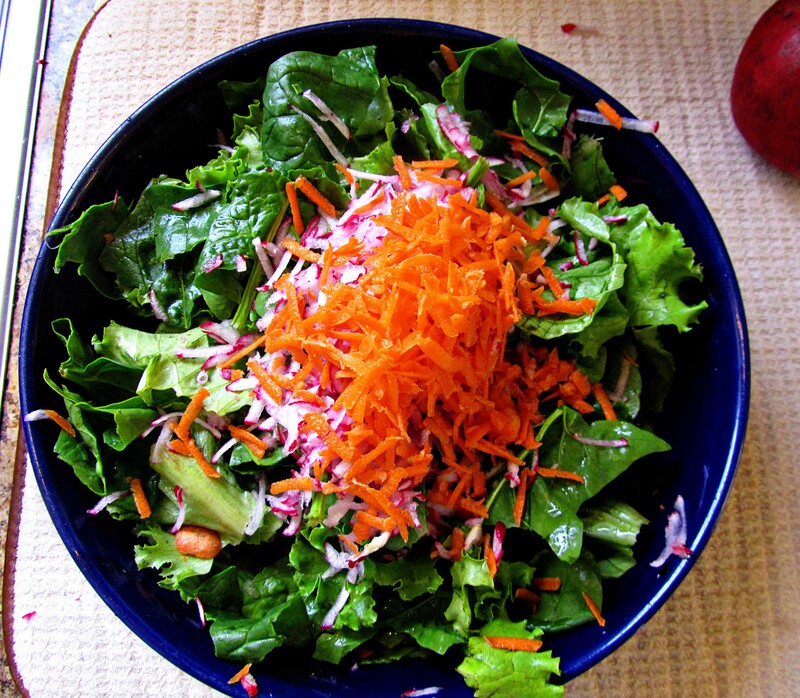 I challenge you to make a Fall Salad. The challenging part is that you have to use the wicker basket of ingredients listed: the word “warm”–this can apply to spiciness, temperature, or color; beets; and Dark Chocolate. The rest is limited by your imagination. I might give it a try also. 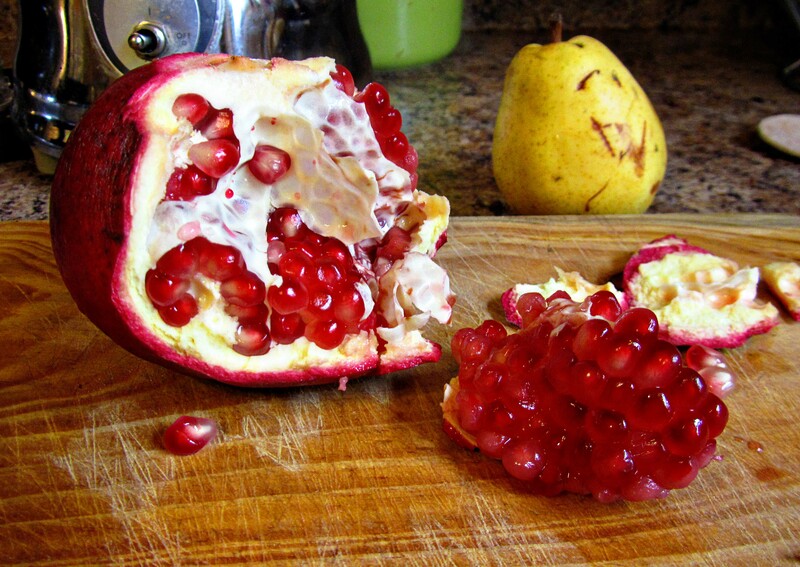 Send in your recipes (and if you have them some photographs) to here. Or add your recipe in the comments section. For those of you that prefer regular mail, contact me for my mailing address here. 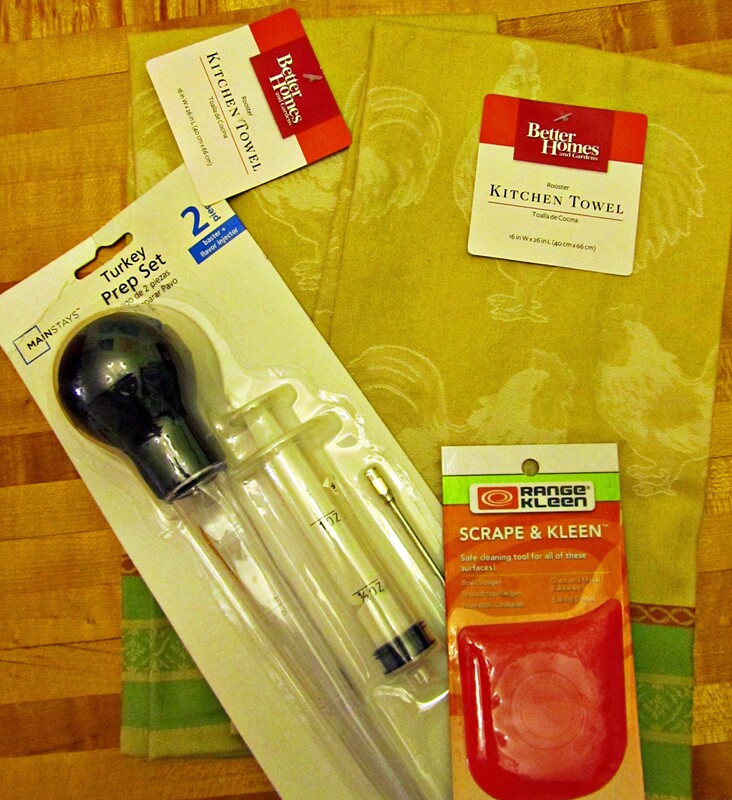 The Grand Prize will be a Garden Basket to help you out with your Thanksgiving Dinner (sorry about the timing Canadian readers) filled with a rooster printed tea towel; a gravy separator; a hot mit; green bamboo salad tongs; an amber, glass, turkey-shaped, mini dish; a turkey baster; and a “Scape and Clean” to help with the clean up. Why did I do this? Just to add a little excitement in our lives. For us to think about something other than the laundry pile and pile of bills. For fun. For creativity. So even if you have never commented before, why not give this challenge a try. The only thing lacking is a good name for the challenge. The Virtual Whit’s End Wicker Basket Challenge? My Whit’s End Friendly Food Fight? Plate Up or Step Down? Give it a name in the comments section along with anything else you would like to add. Let’s give this contest the closing date of Sunday, November 13. That would still leave me a week to get the prizes to you all in the mail. Click “subscribe” to stay current of the latest develpements. Will send my recipe via email because someone (?) might steal my amazing salad.. I like your first suggestion for the contest name…. You keep me smiling. I hope you can squeeze in the contest. On a different subject, (Walk the World’s Rim was my clue) are you using Sonlight? I thought you used ABeka. If you are using Sonlight American History I, I am using American History II, and have all the books. I also have most of the Dash Through World History in a Year (Core 1 & 2) with two different sets of Readers and the Science Stuff. Any chance you would have the Eastern Studies and want to trade next year? I agree about being confused. I think it is Core E that we are doing–the second American History. Core F is called Eastern Hemisphere. It looks really interesting. It seems crazy that all of us are buying all these books. I wish I could think of a way to share the cost somehow. I would be happy to lend out my entire World History Core 1 and 2 to anyone, as I will do Kindergarten with Eloise next year. Also, I would be able to loan out the entire Pre-School (ages 3 – 4) to someone, as Little Man won’t be using them for a long time. A local HS might borrow my American History (Core E) next year, but if she doesn’t decide to continue with Sonlight, then someone else is welcome to it. It would be complete (minus the consumables). A trade would something I’d certainly be interested in if my current system ever fails. I found a lady through craigslist who is one year ahead of me, takes excellent care of her books (Unlike what happens around these parts!) and sells her core to me much cheaper than buying new. How are you liking Sonlight? It helps me keep my “sanity”. “Sanity” being a relative word. It is a lot of time spent reading with the kids, but I think they are learning. I’m not crazy about their “natural” approach to Grammar, so we suplement. Until Little Man goes down for his nap, it is a bit crazy. He spills all the crayons daily, then bites off their tips. He will do this with all the markers if they aren’t WELL out of reach. He finds pencils or pens and colors on the wall, on library books, on the kid’s desks, on his highchair, and on his clothes. He colors on the chalkboard (with chalk which is fine), but then dumps every piece of chalk on the floor. I send LBG down to the basement so he can concentrate on his math, and Scout up to the sttic so that she can read her book in quiet. But he finds them all. He also can let himself out the backdoor (glass “screen door” that I like to use as it lets in natural light) unless it is locked. This past week, I kept hearing, “mama,. . .mama. . .mama. . ” I ignored it as I thought it came from the basement and I was giving a spelling test. Then LBG said, “ITHINK HE IS OUTSIDE!”. It was cold and raining and he was in sock feet. Actually, maybe that is a good thing, otherwise he might have decided to take a walk down the block. SIGH. How in the world do you do it with 7? Well, what you described could be our house instead! 🙂 It does take a toll on your nerves now, doesn’t it?? Allie is totally and completely self sufficient. She has a little room under the eves (old home quirk) off her room where we set up her desk and computer. She often does two days worth in one. It’s great. Now the boys are a completely different ball game. I have to stay on them to HARD to get their Abeka work done in the morning so we can read our Sonlight stuff when Ty (4) and Emma (2) go down for their naps. It’s unfortunate that Tucker’s naps are on either side of Ty and Emma’s so I never am completely free of unschooling kids. Tucker is only crawling though and not as high maintenance as Ty and Emma. (Double emphasis on TY!!!) Emma will sit and color but Ty is a mad man. Troy plays with him but Troy is also in a combo of 1st grade and kindergarten so that leaves Ty on the loose. Everyday is different ~ you know how it goes. Some days you think you’ve got it together, it goes so smooth, people actually do what they’re supposed to do, help each other and cooperate. Then, and much, much more frequently, there are the days when you just muscle through and wonder how you’re going to talk yourself out of bed the next day to do it all over again. I have to remind myself I AM living my dream. 🙂 I wouldn’t trade it for the world BUT, it’s not easy. Keeping the younger kids occupied is just as challenging as keeping my older boys on task. HOW do you convince boys that they need math and language arts??!! It can’t ALL be fun, interesting stories! I’d love to hear what your thinking cap comes up with.